Kicking off on National Voter Registration Day, one of the most prominent open Internet advocacy groups, Fight for the Future, has launched Vote For Net Neutrality, an explosive campaign that seeks to educate millions of people about where Senate and House candidates stand on restoring net neutrality ahead of the midterm elections, enlisting the entire Internet in the mission of pressuring incumbent lawmakers who are facing tight races to do the right thing or face the Internet’s wrath on election day. 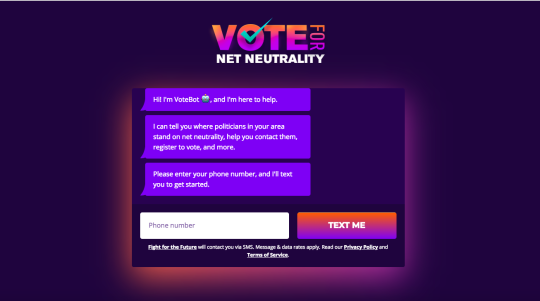 The campaign makes use of cutting edge mobile technology, including a chatbot flow that allows Internet users to register to vote, sign up for voting reminders, and find out where candidates in their area stand on net neutrality, all from their phones using SMS messages. Participants will be encouraged to focus their collective energy to pressure sitting members of Congress in tight races who have failed to take action to restore net neutrality and are facing off against challengers who say they would do so were they elected. Local action teams in key districts are planning protests, lawn signs, and voter education at the polls. Internet users who don’t live in one of the priority districts will be encouraged to join a volunteer texting team to educate as many voters in those districts as possible about where the candidates stand before they head to the polls.